We decided that our first full day in Sicily would be a day for exploring, so after waking up at nine, we had a relaxed morning and wandered down to the market stall we'd seen when we arrived and picked up some of the juiciest peaches, the sweetest cherries and a small bunch of bananas (all for only €3! ), which we ate at the table in the apartment before showering and heading out to explore Catania. 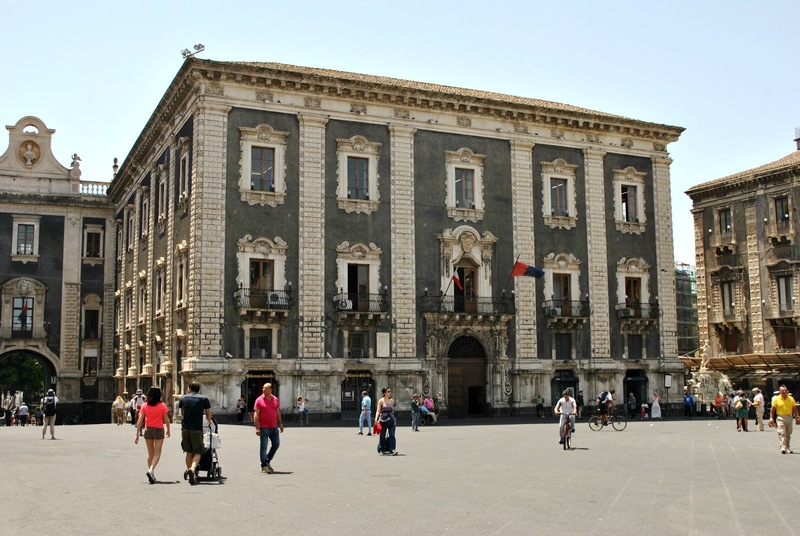 After walking around a little we realised just how close the apartment actually was to Piazza del Duomo, Catania's main square, and the main street, Via Etnea. Via Etnea is a wide street which runs from the Piazza towards Mount Etna (hence the street's name), and as you walk down the street Mount Etna looms over the horizon, with steam pouring out from the main crater. 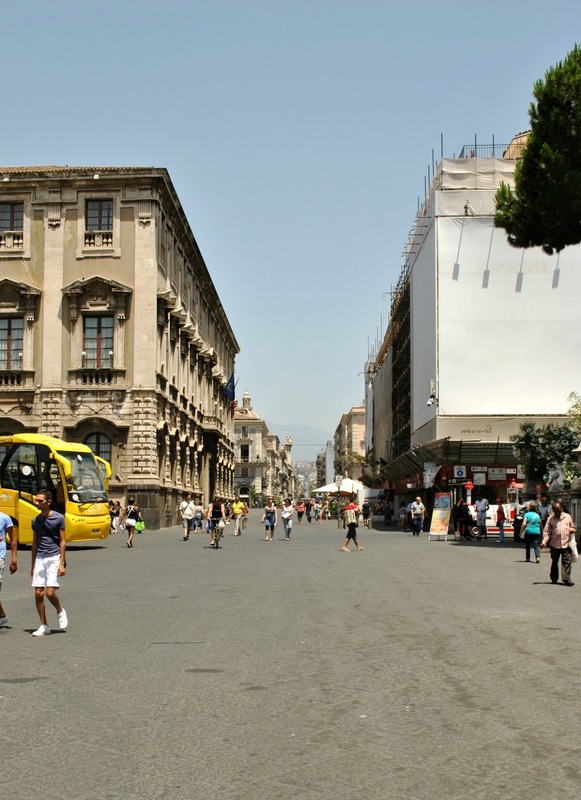 There are quite a lot of shops on Via Etna, all of which are in glorious old Roman and Greek buildings, and the roads and pavements are made from smooth black lava stone made from Etna's lava. We wandered quite close to the main square for a couple of hours, and then we stopped at 'La Collegiata' for lunch. The boy ordered a carbonara and I ordered a 'semplice' salad which consisted of mozzarella, tomatoes and sweetcorn. We also shared a bowl of olives as we'd heard that the olives in Sicily are amazing, and they were pretty darn good; quite a bit saltier than the ones we get back home, but so fresh and fleshy and full of flavour. Once we'd refuelled we carried on walking down Via Etnea, and we stumbled across the remains of a Roman Amphitheatre, which sits below street level. 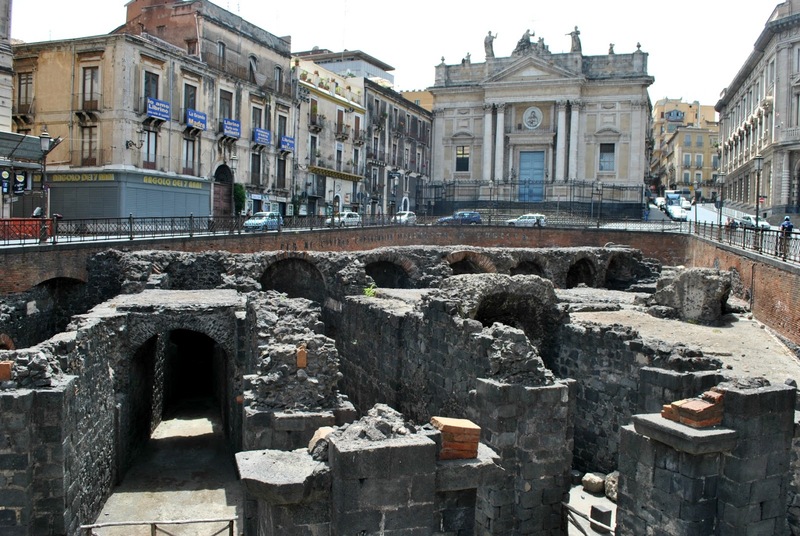 Only part of the theatre can be seen as the rest is buried under the city, but it's still a really interesting sight to see. Whenever I see old buildings, I like to imagine people walking around them thousands of years ago and what they're lives would have been like. 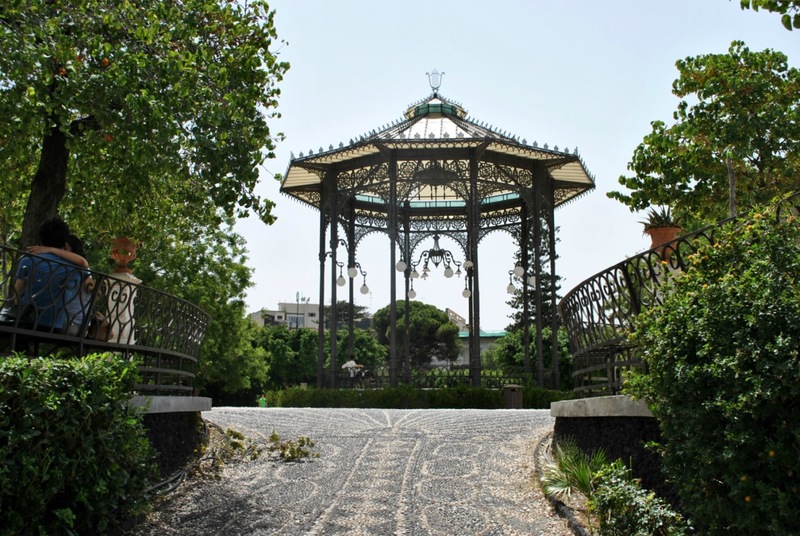 After taking a few pictures of the theatre, we carried on walking down Via Etnea and came to Giardino Bellini, a beautiful park which the lovely Alix of 'Oui Je T'aime Aussi' recommended I visit whilst in Catania, and I can totally understand why! 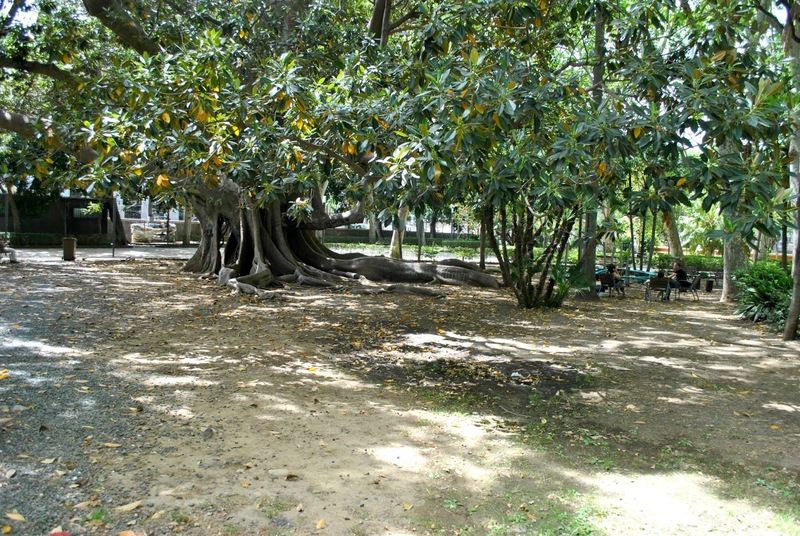 The park is quite large and is filled with trees which provide some much needed shade in the midday heat, and if you walk up the paths you find yourself on the top of a hill with a wonderful view of the park, with the tip of Mount Etna peaking over the tree line. Since we were feeling the 34° heat, we stopped and sat on this wonderful tree for a few minutes to cool down and rest our feet. 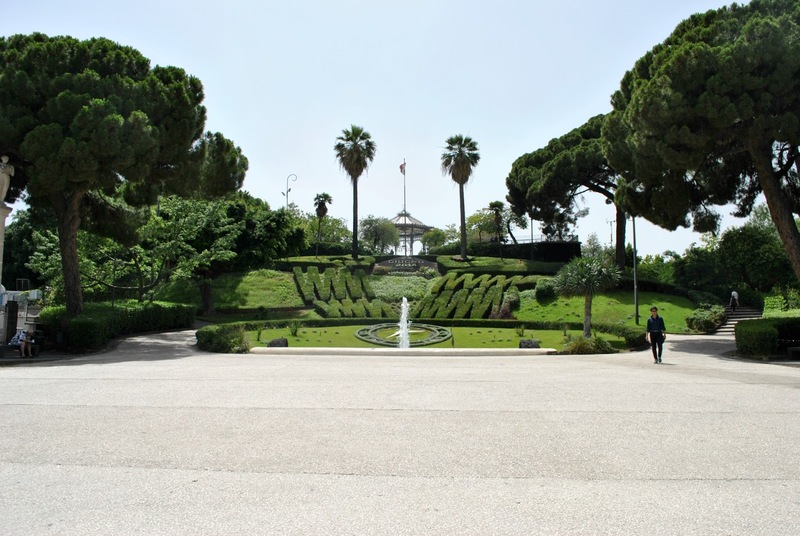 Once we were ready to set off again, we left the park and turned a corner to walk down a different street, and once we felt we'd walked far enough, we stopped for gelato before starting the walk back to the apartment. The boy opted for chocolate flavour and I ordered what I thought was coffee flavour, but actually turned out to be milk and brownie (not that I'm complaining – it was delicious!). Once we got back to the apartment we had a little siesta and then popped out to one of the nearby shops to pick up some coffee and croissants for breakfast the following morning. We didn't feel like going anywhere fancy for dinner, so once we'd freshened up a bit we went back to the small square we'd been to the night before and found 'La Smorfia' pizzeria. We ordered a pizza to share, with each half topped with different toppings, and it only cost us €6! We took the pizza back to the apartment so we could relax, and my oh my was this a good pizza. My half was topped with mozzarella, fresh baby tomatoes, olives and oregano, and the boy's half was topped with mozzarella, olives, mortadella ham, pistachio pesto and fresh baby tomatoes – no tomato puree in sight here! The base was so thin and puffy and it was stone baked, so it was wonderfully crisp and light; definitely the best pizza we had during our trip. We decided that we wanted to go to the beach the next day, so we did a bit of research into which beaches were the best. The beaches to the North of Catania are very rocky, and although the black lava rocks are stunning to look at, I'm not so sure they'd be best for sunbathing on, so we decided we would go South, where the beaches are much sandier and a lot less rocky, to Syracuse (also a recommendation from Alix!). After that, we went to bed with bellies full of pizza-y goodness, ready for a day of relaxing by the sea.